The Amazon Echo Dot is a small, stylish speaker which is the perfect home assistant. It’s a multi-purpose device that works with Alexa Voice Service to help with lots of useful tasks, such as making calls, playing music, sending and receiving texts, receiving news and weather updates, and loads more. The Echo Dot is designed as a convenient addition to any room in your home. Use yours in the kitchen to set timers with your voice, or ask it to read out your favourite recipe whilst baking. 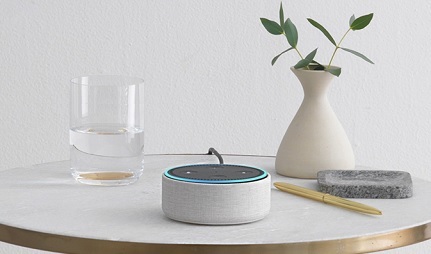 Use the Echo Dot to help you wake up in the mornings, courtesy of a smart alarm clock that can sync with other smart home devices such as heating or lights. 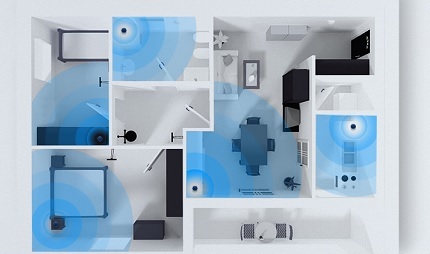 Your Dot can sync to other Echo devices around the house, giving you a fully immersive sound experience. 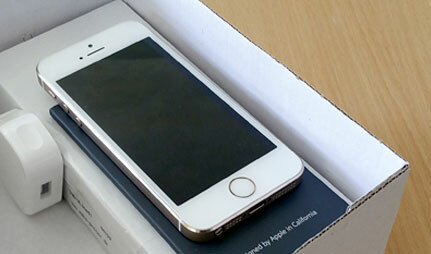 Seven powerful microphones use beam-forming technology, and are able to pick up your voice across noisy environments. Additionally, Alexa will respond from your closest Alexa device thanks to Echo Spatial Perception technology. All you need to do is say “Alexa” to wake your Echo Dot for action. Experience more control over your music than ever before. 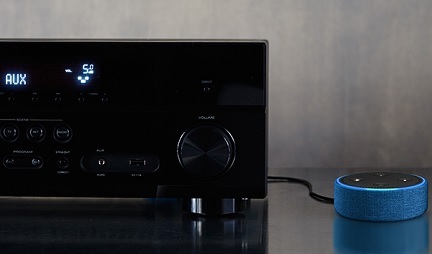 Ask for your favourite song, playlist, genre or even mood, and Alexa will deliver. If you aren’t sure what a song is called, you can even search by lyrics. Also, use Alexa to discover music trivia, such as when an album or single was released. If you sign up to Amazon Music Unlimited, you can enjoy access to over 40 million songs. Stay connected with your family and friends with calling and messaging functionality. Make calls completely hands free - all you have to do is download the Alexa App to your phone, and synch to your Alexa device. 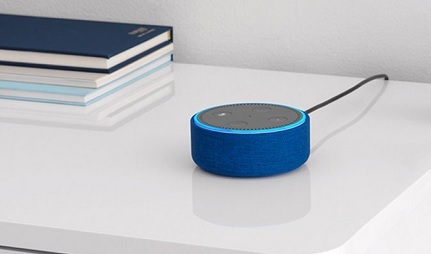 You can even call or send messages to your family’s Echo Dot, updating them if you’re running late. Available across the UK at no additional cost, the Alexa App is available on iOS and Android Smartphones. Your Echo Dot allows you to take control of your other smart home devices like never before. Compatible with smart lighting, televisions, thermostats and more, you can make commands without lifting a finger. 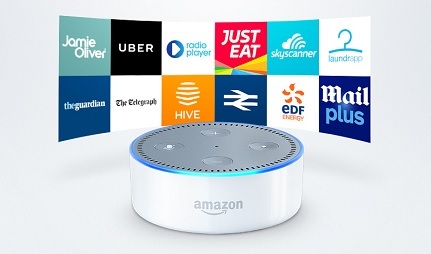 Echo Dot is compatible with some big Smart Home products like WeMo, Samsung SmarThings, Philips Hue, Sony, Hive, Netatmo, Tado, Nest and others. The Echo Dot is ready to make your life so much easier. Order takeaways from Just Eat, request a lift from Uber, check upcoming train times and more. 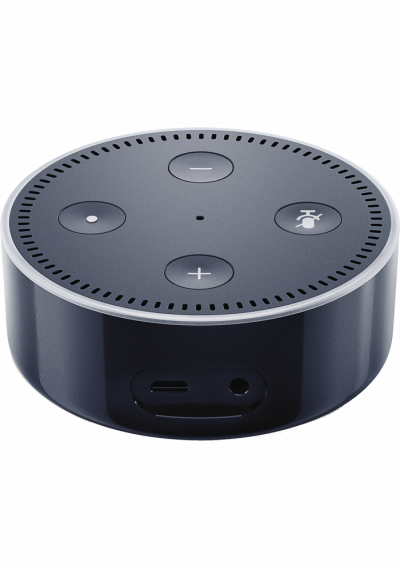 The Alexa software is constantly being updated, so check the Alexa App for new skills and to discover the full potential of the Echo Dot. 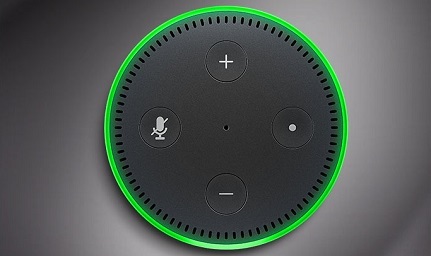 It’s simple to use - just plug in the Echo Dot and connect to the Internet using the Alexa App.